Love this sushi. Always fresh and delicious. Just make sure to call ahead and give yourself about an hour and a half before picking up. All the reviews are right. Here in Orleans, we now have premium quality sushi and sashimi, generous portions and better prices than anything downtown. Call hours ahead to place your order, because they're that busy. My only gripe--they add too much sugar to season their rice. I know because I roll my own sushi. After coming here, you'll never want to do ayce sushi again. All the reviews here and elsewhere are spot on. This is excellent sushi. The portions are large too. Can't wait for my next sushi meal. As said by others, call ahead if you want to eat early. It opens for dinner at 4pm. By 4h15, you're not likely to get your sushi before 6pm. I'll call at lunch time next time for my sushi to be ready at 5pm. Such great sushi and rolls. Always the freshest! Value is amazing! 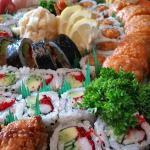 mr. Sushi an is a great sushi restaurant in Orleans, Ontario. The fish is fresh as can be and the creativity of the sushi chefs is outstanding. This is a small and busy place, and take-out orders form a major part of its business. I recommend that you order by phone well in advance of your time of need and set arise for your pick up - you won't be disappointed. Been to Hello Sushiman? Share your experiences!